Hi peeps! Winter temperatures are slowly dragging in around here and I've been keeping warm inside this new café crush I've got going these days. That's right! I've finally found a nice, chill spot down in the Village where I can write, read, and sip on the best caramel apple cider I've ever tasted. Just thinking about heading down to The Vagabond Café makes me feel all mmm because they've got free live music going several nights a week, the owners are down-to-earth (Mike even sings and is playing a mean guitar right now), and I'm pretty sure I'm thisclose to saying, "I'll have the usual" upon walking in and getting my mug of hot cider. Haven't you always wanted a place like that? 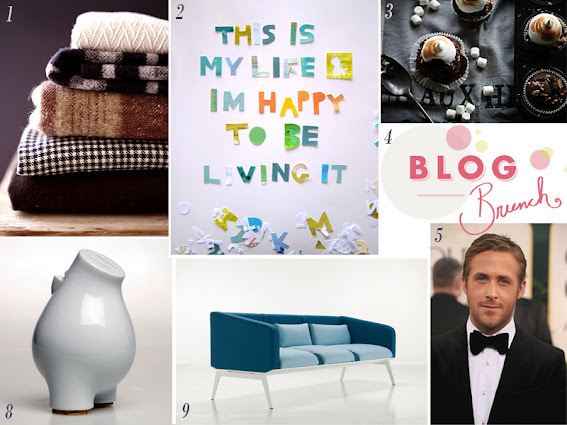 Here are 10 other things that have made me happy this week and yipers, can you believe Thanksgiving is less than a week away?! 1. Twelve soft, warm, and cozy throw blankets. 2. Words to live by. 4. Network, share, learn, and dream with other creative bloggers. 7. These entries for National Geographic's Photo Contest 2011 are breathtaking. 8. A curious little piggy bank. 9. This couch makes me want to move out and buy all my furniture again. And 10. Congrats to Joyce and her little baby boy! a big fat YES on #5! I don't know what people's issue with Bradley Cooper is, but I like him. He gets my vote, and I wasn't at all disappointed with their choice. Jake G. Seriously? What am I missing???? Hey when Hangover came out, I was ALL ABOUT Bradley. Kid is hot. But lately, I don't know, Ryan Gosling is just too cute for words. As for Jakey, yeah, never got that one. But then again, I don't get the world's obsession with Brad Pitt either. SO overrated. See, that's Ryan Gosling in that photo and I was thinking Jake G. LOL They all kinda look the same to me.....but you don't get the Pitt thing? I would certainly turn my head for him. The scruff, the slightly silently edged curiosity to him. I like it. No, I haven't seen that one yet, but I wanted to. Must put it on my list so I can remember.